Many remember Leni Riefenstahl first and foremost as the director of The Triumph of the Will, the Nazi propaganda documentary that revolutionized filmmaking. Hitler also asked her to film the 1936 Olympics–from which she produced the two-part film Olympia. Unable to continue directing films after the war, Riefenstahl eventually turned her sights on Sudan, and became the first foreign woman with special permission from the Sudanese government to live in the remote valleys of central Sudan. The people with whom she lived in Sudan had no knowledge of her Nazi past in Germany. 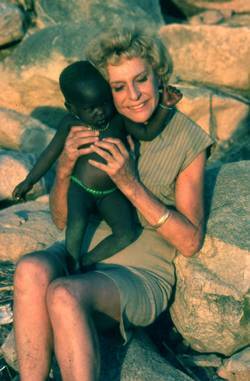 Riefenstahl’s celebrated photographs from Sudan were published in 1974 and 1976 as The Last of the Nuba and The People of Kau. Both books became international bestsellers. She also shot 3000 meters of film. For her work in Sudan, the Art Director’s Club of Germany awarded Leni a gold medal for the best photographic achievement of 1975. This “perfect German woman” (in the words of Hitler) was also granted Sudanese citizenship for her services to the country–becoming the first foreigner to receive a Sudanese passport. In March 2000, while making a film about her life, she was injured in a helicopter crash in Sudan, while traveling under the assumed name of Mrs. Jacob. She died in 2003 at the age of 101 in Germany. Though Steven Soderberg abandoned his Leni Riefenstahl biopic project last year (and the long-awaited Jodie Foster project has failed to materialize), Riefenstahl will soon appear on movie screens as a character in Race, the Jesse Owens biopic. Her character will be played by Carice van Houten, who plays priestess Melisandre on HBO’s Game of Thrones.